The Final Fantasy VI Relocalization Project is an attempt to "relocalize" the FF6 in a way that the original localization team might have done, if they had more time and ROM space to do so. And less restrictive censorship. I know there are tons of projects with a similar goal, but here's the difference - um, it's the one I made, I guess? There's a download and everything! 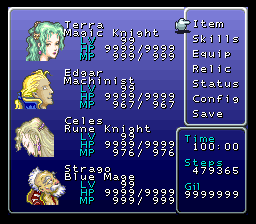 I owe a debt of gratitude to tons of people in the FFVI hacking community. I've barely posted here but you folks have helped this lurker figure out tons of stuff, including some ultra-basic hacking work I now have the ability to do! Not to mention providing me with a whole mess of bugfix patches to include in the project. I have tested EVERY one of these. Right now I do not believe that there are any showstopping bugs that weren't there before. Patches from the following awesome people were used: Angelo, ArmorVil, Assassin17, Darkmage, Djibriel, Drakken, Imzogelmo, Kejardon, Lenophis, Novalia Spirit, Lenophis, Master ZED, mblock129, Novalia Spirit, Terii Senshi, and Yazoo. Comes in both headered and unheadered flavors! I'm on v1.01, currently. There's not much left at this point, besides play it and find more typos and broken captions that I might have overlooked or broken without noticing. I've played through it several times now but you can never be too careful. Anyway, that's it! If anyone has any comments or criticism I'd appreciate it. Or if you play it, let me know about anything that's weird. Also I hope this is the right place in the forums for this? It seems like it is. No offense to you Dr. Meat, But I honestly think there are too many hacks like this. I would appreciate it more if it was a different story, different Items or a spoof of some kind. (09-02-2014, 05:34 PM)Cyprus Wrote: No offense to you Dr. Meat, But I honestly think there are too many hacks like this. I would appreciate it more if it was a different story, different Items or a spoof of some kind. No offense taken, of course. I know there are lots of projects like this. This was started by a friend and I looking for a hack that already existed but didn't really find one that was either completed or up to our fairly specific, probably stupid expectations. I don't know how possible it is to create new spells and espers, but the new dungeons are something I'd very much like to figure out how to do, at least! It seems possible...? Well done. I don't think this one is redundant at all; it seems rather complete and a good effort at compiling many various small fixes. There are even some ideas in here that I haven't seen before, like incorporating the correctly-metered opera lyrics. I think that's a nice touch. The only criticism I have is that this seems rather subject to a bit of feature creep. If the aim is a "relocalization", I would have kept the changes to concern ONLY the script, menu text and graphics, and let people choose to incorporate bugfixes and gameplay tweaks on their own. As it stands, this patch will conflict with many other patches. This is just my personal opinion, but I believe that only by working together will the FFVI hacking scene truly shine, and that patch authors should carefully define and limit their scope and take care to implement their patches in a way so they will work together with other patches. No one person can do all the work, but if we work together, we can create great things. Finally, any retranslation project, no matter how "official" it aims to be, is going to adopt the personality and quirks of the author. I would like to see some upfront commentary from you on some of the potentially dividing choices of phrases and characterization. Like, in your opinion, is Locke a brooding character? Or is he rash and goofy? Was Celes attempted suicide an act of the moment, or a defining character trait? Etc. When you say esper butts, are you referring to Siren? 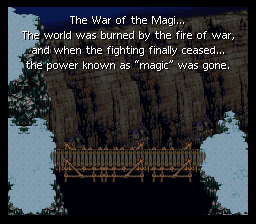 Or did you actually successfully manage to change the battle background in the final tower-of-espers battle before angel Kefka to that of the original, uncensored FF6j? While we're at it, did you change the CAFE sign in the Zozo battle background? If not, and you feel the need to be complete, I challenge you to do exactly that. I've tried, and it involves compressed graphics and stuff that I am not experienced with. (09-05-2014, 04:17 AM)seibaby Wrote: Well done. I don't think this one is redundant at all; it seems rather complete and a good effort at compiling many various small fixes. There are even some ideas in here that I haven't seen before, like incorporating the correctly-metered opera lyrics. I think that's a nice touch. Thanks very much! It was very, very important to my friend that the opera lyrics be perfect so I paid extra attention to it to appease her. I think it's actually timed better than in the original english localization now. Quote: The only criticism I have is that this seems rather subject to a bit of feature creep. If the aim is a "relocalization", I would have kept the changes to concern ONLY the script, menu text and graphics, and let people choose to incorporate bugfixes and gameplay tweaks on their own. As it stands, this patch will conflict with many other patches. Okay this is actually an incredibly useful piece of criticism. It's very true and I think if I had really been a part of the community before, it would have been something I considered ahead of time. The way this came about was, I was talking to a friend of mine and we were kind of lamenting that no English version of FFVI was really "perfect" (not that such a thing is possible). The SNES version has its hurried translation, the PS1 version is the SNES version with awful load times, the GBA version has a much better localization but various technical problems. So the goal we set out for was to make a "perfect" (yeah, I know) version of the game - with as many known bugs fixed as possible and a script that hopefully takes the best from all sources. If I'd been thinking ahead, I'd have probably made the project a bit more modular so it could more easily be the base for something else. I can still do this, and probably will, but not right away. Um, so yeah, "Relocalization" might be a bit of a misnomer, but I was struggling to come up with something to call it and that seemed best. It was almost "Final Fantasy VI: Championship Edition" which would have at least been funny to me. Quote: Finally, any retranslation project, no matter how "official" it aims to be, is going to adopt the personality and quirks of the author. I would like to see some upfront commentary from you on some of the potentially dividing choices of phrases and characterization. Like, in your opinion, is Locke a brooding character? Or is he rash and goofy? Was Celes attempted suicide an act of the moment, or a defining character trait? Etc. This also brings up a good point. I should have been more explicit about how the script is actually composed. It is very close to the GBA script, for the most part. Probably 80+% is the same, or more. With that said, I did completely go through it multiple times and compare against all other available translations and check them against one another to try and preserve anything that may have been lost. Part of that process was trying to ensure that characters' voices remained consistent with the GBA translation. Celes is probably the most divergent, but only just - she's a bit more cool towards characters who aren't Locke, but that's about it. Quote: When you say esper butts, are you referring to Siren? Or did you actually successfully manage to change the battle background in the final tower-of-espers battle before angel Kefka to that of the original, uncensored FF6j? Yeah I just meant Siren there and put it in a sorta jokey way. However, the Cafe sign in Zozo's battle background does indeed say Pub now. The almost-final boss graphics are not changed (yet) but I'll look into it. Honestly it's something that slipped past my radar! Thank you so much for all the comments and criticism! You're welcome. Thanks yourself for all the effort you put into this. I didn't see any mention of the Zozo battle background Pub sign in the credits section, did you make this change yourself? If so, how did you change the battle background? I'm inexperienced with graphics hacking, but I believe the battle backgrounds are compressed somehow. Would you consider releasing that change as a standalone patch? If you can figure out the final battle graphics, that would be a great contribution to the scene. It is the last remaining censored graphics in FF3us that don't have an uncensoring patch available or is easily modded with sprite editors. I took a quick look at it and it seems pretty tricky. The offset for the tier 2 graphics have been documented by Lord J and can be found and presumably decompressed and edited with Peer Sprite Viewer and yy-chr. game locked up at the transition to the third tier. room for it somewhere else. I can see why this hasn't been done yet. At least, not that I know of. Supposedly Lord J has made a patch that restores these graphics but is buggy, but I can't find it. Contacting him for any clues could be helpful, however. Okay, another update. Thanks to Lord J's site, I found the uncensored graphics from FF6 Anthology! I tried recompressing them into FF3us using Peer Sprite Viewer, but unfortunately, the compressed block is too large and screws up the ROM. I'm not sure where to go from here. Recompress the graphics to a smaller size. I'm not sure which compression algorithm FF3us uses nor if there is a tool which allows the compression method to be tweaked to achieve smaller filesizes or if the result would even be compatible. The best bet is to move the compressed graphics to an area of free space in the ROM, then change the relevant pointers. I don't know where the pointers are located though, or if there is an accessible block of free space big enough for the compressed block (I'm not even sure how big it is, I think it's just a few bytes bigger than the original). Here are the uncompressed graphics if you want to give it a try. I made a similar project in uncensoring FFVI but to keep the translation close to the SNES original, while making bringing the lines closer to the original Japanese. I was able to use expanded spell names, character class names, B button dash, and uncensored graphics. I still give thanks to the people who made the other patches to help in my version. 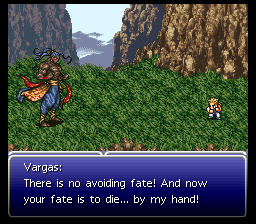 Like you, I haven't been able to get the final battle tiers to Kefka changed yet. If you wanted to look over my version you're more than welcome. I think we can all benefit by pulling our resources to get this taken care of. If anyone is successful in doing so, I would gladly give thanks in my own hack for it. Well, to get the final battle tiers to Kefka changed, you have to edit those backgrounds, since the graphics aren't monsters sprite. (09-06-2014, 05:13 AM)seibaby Wrote: I didn't see any mention of the Zozo battle background Pub sign in the credits section, did you make this change yourself? If so, how did you change the battle background? I'm inexperienced with graphics hacking, but I believe the battle backgrounds are compressed somehow. Would you consider releasing that change as a standalone patch? That graphic seems to just be recycled from the main graphics tileset used in Zozo, so I'm pretty sure once I did that it was changed in the battle background too. I didn't do anything complex, at any rate. And yeah that's a change I made myself. I did submit it to RHDT as a standalone patch (though it was rejected ), so I can definitely make that available for folks to use! Quote: The best bet is to move the compressed graphics to an area of free space in the ROM, then change the relevant pointers. I don't know where the pointers are located though, or if there is an accessible block of free space big enough for the compressed block (I'm not even sure how big it is, I think it's just a few bytes bigger than the original). Yeah I tried to do what you did at first and came away with the same results. Although I was able to get the lady ("Magic"?) uncensored without breaking anything else, I don't think I'd be able to do the same to the others without some serious trial and error. If we can find the pointers to that data it seems like it wouldn't be too tough, especially if the filesizes of the two graphics are within a few bytes. I think in the US version there's 64 free bytes right after the Kefka background so if the order of the backgrounds could be rearranged it might work? Heck if I know. But I will be looking into it further - it'd be really nice to get that figure out! I've become fairly adept at moving data around so I'll report back with any results I find. UPDATE 1: Okay, so I was able to uncensor the 2nd tier of the final battle! First up, from E71650-E71848 (no header for these addresses) is a pointer table (3-byte) which points to where the graphics are for the corresponding background - and many of the backgrounds definitely use graphics straight out of the town/dungeon/etc tilesets, like Zozo. That's why changing the Cafe sign to Pub for the town changes it in the battle background too. Literally the same graphic. There seems to be a second pointer table but I'm honestly not sure what that does. E7A9E7-E96300 is where the actual background data is, with some free bytes in the US version at the end. So at first what I did was just copy ALL of FF6J's background data from including the pointer table (from E71650-E96300). That messed up backgrounds that took graphics from the town/dungeon/etc graphics since the FF3US graphics are offset slightly from the FF6J graphics. Oops. Using Lord J's offset compendium, I found where the final battle backgrounds start (E8D366), then went back and located it in the pointer table (E71707). So then I tried copying everything from E71707-E96300 out of the FF6J ROM, leaving intact the earlier parts of that pointer table (a smarter way to do it would probably be to just copy the last bit of that pointer table from FF6J, then copy the data from E8D366-E96300, but that's not what I did... it's 3AM). To be clear, this is JUST the uncensored graphics for FF3US 1.0, not my larger project or anything. I have not tested this patch beyond completing the final battle and doing a few random battles in Zozo and few other places. I don't know if it will reveal itself to be totally messed up somewhere. I'll definitely keep working on it but I wanted to let you all know how it went. And it's almost 4AM here so if any of this info is goofed up sorry about that. Edit: Oh, also - I didn't actually realize this until just a moment ago, but tier 3 is censored as well. That's fixed too, as you can see. UPDATE 2: There was a problem with doing it that way (unsurprisingly). The Kefka background isn't the last one in the offset table so copying the last section of the pointer table screwed up a few backgrounds, like Darry's tomb. You JUST want to copy from E71707-E71724 out of FF6J into your US ROM. Then copy from E71848-E96300. That's all the compressed graphics data. The patch was updated to fix that. I think it's probably good now? Still hasn't been tested very thoroughly though. I've probably only fought on about 15-20 backgrounds so far. If you use it, let me know how it works.